The perfect brush to keep the tangles away from your horse’s mane and tail. Announcing Trade Supplier of the Year Winner at the 2015 BETA International show in Birmingham, UK This past week, Greg Giles, CEO of Cavallo Horse & Rider, attended the BETA (British Equestrian Trade Association) show in Birmingham, England. We just received an exciting report from an overjoyed Greg, letting us know that Battles (one of our top wholesale suppliers of Cavallo Hoof Boots) just won the BETA "Trade Supplier of the Year" award for 2015! To top it off, this is their second year in a row claiming this prestigious award. In his acceptance speech, Battles Managing Director, Jim Bowen, said, "This award is voted by the retailers and is acknowledgment of the ongoing service and excellence that Battles has provided...and is also reward to our exclusive vendors, like Cavallo, that they are being well represented in the U.K. market." According to Claire Williams, Beta Executive Director, “The BETA Business Awards have become a prestigious landmark within the equestrian industry’s calendar. They have continued to develop in popularity year upon year, with increased nominations and a growing spirit of competition. 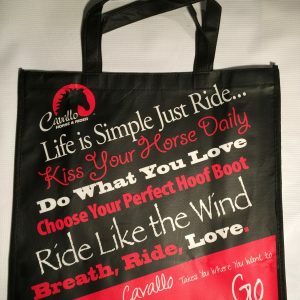 The awards are a tremendous way for the trade to recognize and celebrate the achievements of its members.” Cavallo Horse & Rider began their business relationship with Battles in 2009. Carole Herder, Cavallo President, says they have never looked back: "It's been a privilege to work with such a highly esteemed company as Battles. I feel our combined efforts truly continue to change the world, one horse at a time!" A company known widely for their forward thinking and personal approach to business, Battles has enjoyed 182 stimulating years in operation, evolving and progressing dynamically through their commitment to thriving in an ever-changing market. They have continually embraced technology and innovation without losing sight of tradition and the expectations of their increasing customer base. This award is encouragement to us, at Cavallo, who are so warmed to see a company like Battles working hard to further our efforts to increase the comfort and well-being of horses in The United Kingdom. Battles Wins Back to Back! About Cavallo – Meet the Team!